Didn't that book rock! I absolutely loved it. 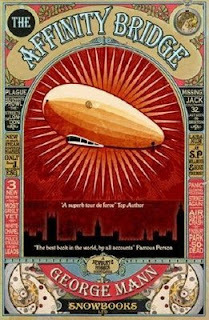 Which is why I can mention that Ghosts of Manhattan will be out April 2010 in the US from Pyr. It certainly did rock. I'm glad Pyr picked up Ghosts of Manhattan. What little of it I've seen definitely piques my interest. Thanks again. Story here - in this case, we didn't actually pick it up (after a UK publisher). Truth is we were in the bidding for Affinity Bridge and lost it to Tor (and to my good friend Liz Gorinsky, who is really doing right by the book, and so no hard feelings anywhere and happy for all concerned). But George knew I was keen to work with him, so we sat down and discussed ways we could work together, and in a steampunk setting, that would be suitably different to TAB while retaining those elements that I had responded to in the first place. Ghosts of Manhattan is the result, which is also steampunk, but set a few decades later, and in another continent, from TAB. Then his UK publisher, Snow Books (who are awesome and also really doing great work for George) picked UK rights up from him after our deal. Thanks for the inside scoop! That's a great philosophy to go by. When you can't acquire a great work just try to work with the great writer. I worry a bit when I see a series that is expected from the onset to be longer than 3 books (even a planned trilogy strikes a little fear in my heart). Of course, I will check this one out and prolly love it. Maybe my fear is that I will have to wait to read the others. In defense of the book there is not much left in the air that happens except something at the very end, which will only make you want to read the next. Also, Mann seems to be on the ball. The 2nd book will be out shortly in the UK and the 3rd early next year. 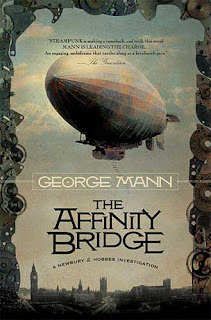 I loved to read The Affinity Bridge. I can't wait to pick this one up.